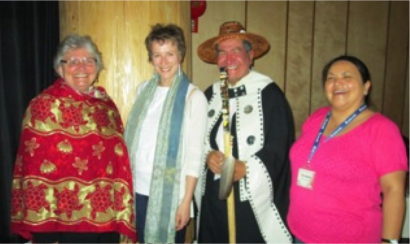 Over three days in May 2014, the Health Arts Research Centre held a gathering in the Waap Galts’ap Longhouse on the Northwest Community College campus in Terrace, BC. Our intention for this inaugural gathering with HARC Advisors and Guiding Collaborators was to connect and reconnect with one another on the issues, principles, and experiences that draw each one of us to working with the arts, humanities and creative expression to renew health and wellbeing. Indeed, the gathering kindled a spark that ignited our hearts, minds and relationships; provided time to reflect on our experiences together and to dream about what is to come for all of us in partnership; and to vision about what is yet to be revealed through our many hands put to this important work. The Waap Galts’ap Longhouse in Terrace was the perfect setting for our time together. In remembering the feelings of hope, togetherness, collaboration and insights we all had there, our HARC team has summarized our collaboratively developed research themes and directions. These are the integral and basic ideas upon which we all can build a comprehensive and cohesive vision for moving forward. Through our discussions and work together at the HARC Spring Gathering we have collaboratively identified the following themes and ideas to pursue in our efforts over the coming years. Decolonization has been identified as a central principal for the work of the Health Arts Research Centre and our partners. This includes staying connected to the work of hopeful change and decolonizing our own minds and work. A HARC commitment to changing together and bringing this transformation to our communities also includes meeting together in community. We will be gathering resources on Decolonization and decolonizing methodologies and envision developing a full page to this theme on the HARC website. We are a Community of Transformative Practice. This theme is a composite of many of the visioning statements shared at the closing of the gathering in Terrace, and of course, the name is up for suggestions. This comprises the ideas of taking heart in bringing pressing questions into the world together; creating ecologies within our communities and Nations, our places of work and our institutions to give space to new holistic visions for health and wellbeing that incorporate art and emotion; and to make art to create understanding in our own lives, the lives of others and to nourish the “ripple effect” of our work and our energy in cultivating understanding in broader society. We actively seek to create dynamic process to bring collaborations together and support them through art and art-making. We will be dedicating space on our website to feature transformative practices of our larger group, and we will be gathering resources on arts-based transformative practices for health, determinants of health, and health education. We relate to Art as Connection as a powerful medium to combine modernism and traditional ways of being, and to engage our hearts, souls, minds and hands in relationship with ourselves, one another, all our relations that have gone before and who are yet to come, the world around us and Mother Earth. We embed the practice of connection in our lives and we honour the power of the process of creating art, engaging with art, and sharing art to connect people, disciplines, places, hope and ideas in relationship. We actively seek to bring people to the practice of incorporating art into who they are and how they work; we actively seek to bring art-making to the critical and urgent questions around health and wellbeing in northern and indigenous communities. We will be creating gallery space on our website to feature made art from our larger group; this is using the broad vision of art to include all mediums and approaches. We relate to Art as Wellness and lean in to the practice of using art in our everyday life to promote wellbeing. In dreaming the highest dream for northern and Indigenous communities, we find ways to brink art-making to shed light on our stories: stories of our lives, of our families, and of our histories; stories about medicine and medicines in our own lives and the lives of those around us; stories providing positive and hopeful visions for the future; stories providing contexts of who we are and how we come to interact with these hopeful imagined futures for people in the north . We actively seek to bring art-making to the creation of spaces and opportunities for connection, emotion, spirit, self-care and talking; we actively seek to bring art-making to inform conceptions of wellness and renew health and wellness in the north. Access to Services and the Commodification of Health including two-eyed seeing with both traditional medicines and bio-medical strategies, north/south health services inequities, and transportation. Addressing Ignorance of Indigenous Culture and History including a focus on holistic health, racism, gender roles, residential schools, language and culture, art and spirit. Creating Healthy Community Spaces with art and sport, wellness initiatives, mental wellness focus, and helping to nurture relationships, resilience and connections with elders and 3 generations. Political Issues work engaging with systemic issues that create inequalities, system disparities, industrial profiteering and the legacies of colonialism and treaties. Social Movements supporting resistance, kitchen table knowledge, Idle No More, and using art as a political tool. Knowledge and Two-eyed Seeing working to integrate exclusionary systems with Indigenous knowledges, disseminating information and knowledge using art, talking circles, and working against pathologization of communities. Addressing Needs for Healing through music, trust-building, art, truth, stories, understanding, relationship, and seeing Earth as home.